It sounds lovely, doesn't it? This phrase is my golden rule - what I strive for, yet find so difficult to execute in reality. One thing is for certain - it's much easier to have an organized, aesthetically pleasing space when there is less stuff. Fewer items, less clutter. So I've made it my mission this year to keep purging things I don't love from the house. 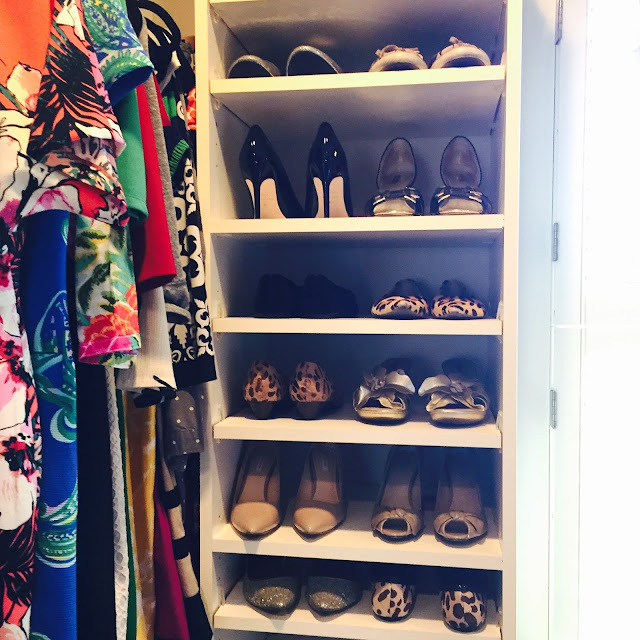 My closet has actually been the easiest - my goal is to only own things I enjoy wearing and that make me feel good. I'd so much rather have a few phenomenal pieces than a closet packed with clothes that don't fit me well and that I don't wear (making selecting an outfit ten times more difficult, and ten times longer, because I have to rifle through all those pieces I don't really like, am I right?). Try it right now. Walk through the house and I bet you can find ten things you can either toss or donate. Do it, and you'll feel so much better and lighter. Then, read below for my favorite organization tips. I've acquired these from various places over the years (magazines, blogs, trial and error) but they all make my life a bit easier. 1. Hang your necklaces on decorative hooks. This is a space saver, plus it gives you easy access to your necklaces, as well as lets you see them all at the same time. Back when we rented, I used Command Adhesive Strips to secure the hooks to our closet wall. In our last two houses, I had Max drill them in. I found my hooks in the Anthropologie sale section years ago, but I'm loving these ones and these ones that they are currently carrying. 2. 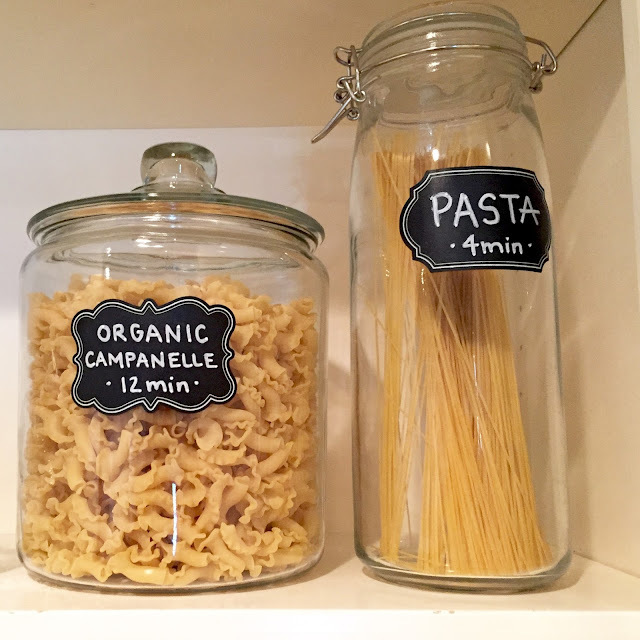 Combine Chalkboard Stickers + Clear Containers. I love this idea for frequently used kitchen ingredients: pasta, sugar, flour, chocolate chips, the list goes on. You can find the glass canisters at Target, and my favorite plastic ones are these made by Oxo. 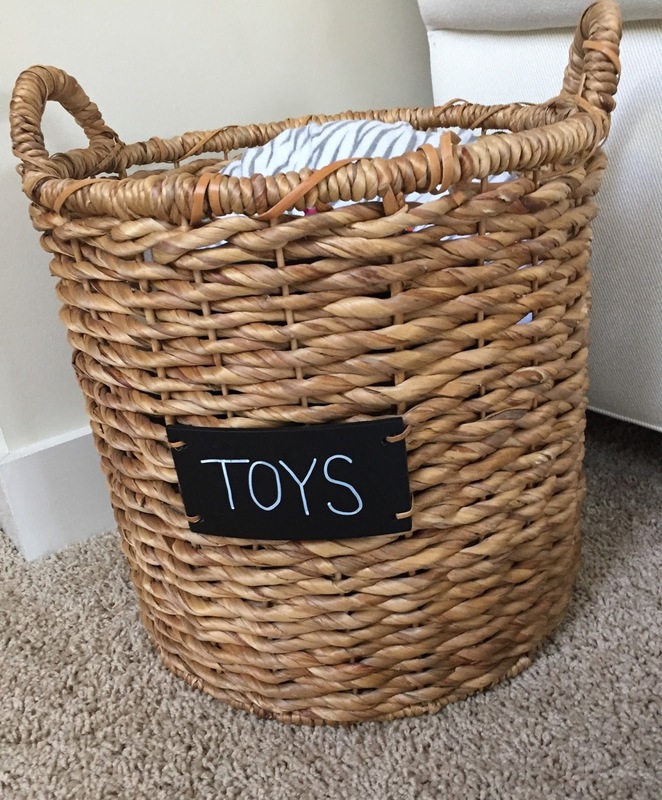 Look for chalkboard stickers in the Dollar Bins at Michael's and Target. Tip: always write with chalkboard marker - plain ol' chalk will wipe right off the first time you grab for the container. 3. 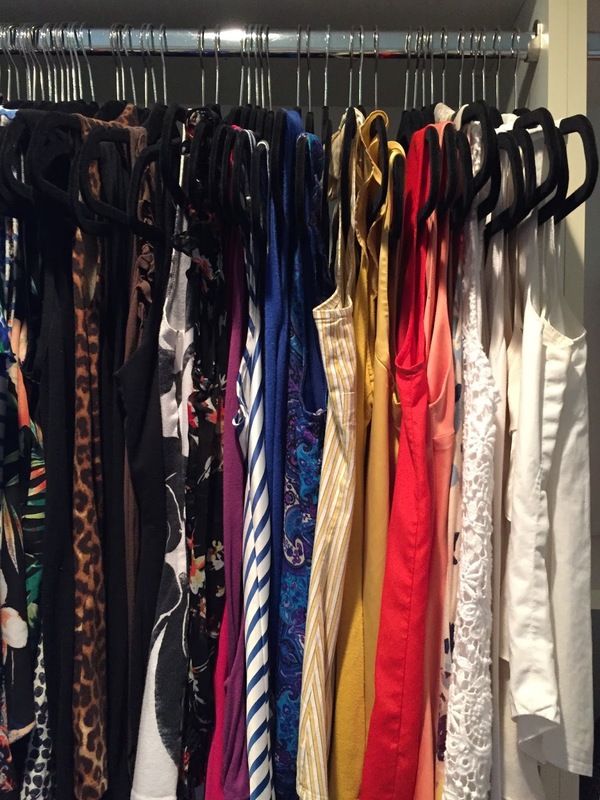 Invest in matching hangers for your clothing. Black Velvet Hangers allow you to fit more clothing in the same space because they are super slim. I just love the look of uniformity, too! 4. Use tiered shelving for canned goods. 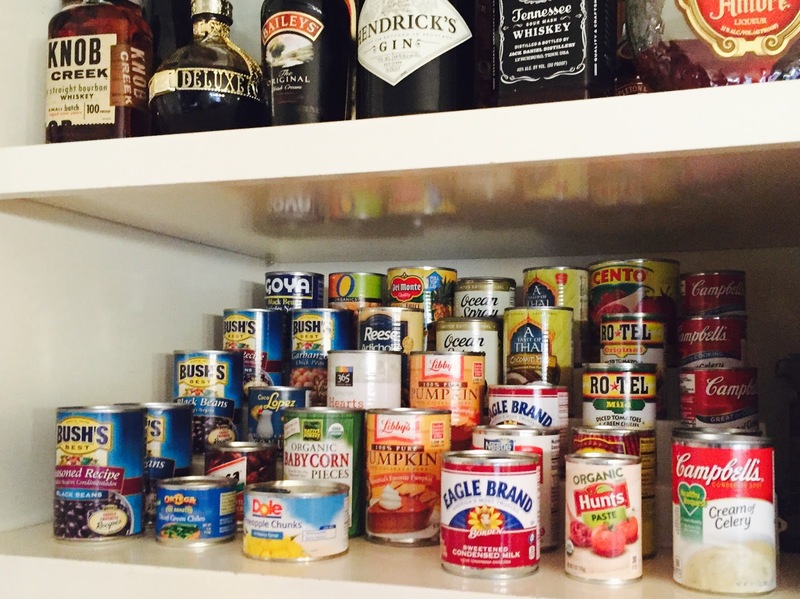 This actually takes up more space in the cabinet, but allows you to see all your canned goods at the same time. I so prefer this to forgetting about them and not knowing what I have on hand. 5. Store folded sheet sets inside one of the pillowcases. When laundering a sheet set, fold the fitted and flat sheet along with one pillowcase. Stack and place inside the second pillowcase. This will contain the set, keep it together, and make it easy to remove from a linen closet when needed. 6. Keep small jewelry in ceramic egg crates. Just like my necklaces, I love having these tiny pieces on display. Find adorable egg crates here and here. 7. Show off your shoes. I love a tall bookcase for shoes. Use up that vertical space in your closet! Bonus, you'll smile every time you see those cute heels you own but never get to wear (oh wait, that might just be me...). Or something like that. I can't remember where I read the advice, but it went something like this: If you are getting ready to put something down, put it in its proper spot. Do it once. This was a lightbulb going on for me. I can't tell you how many times I'd walk downstairs with a laundry basket and leave it on the kitchen table instead of just taking it to the laundry room. I was making more work for myself in the long run - it would take maybe thirty seconds longer to simply walk it to the laundry room where it would be ready for me later. Since reading the advice I really make an effort to find the proper spot for items I'm holding the first time through - saving time and minimizing clutter. 9. Baskets for the win! I have an obsession bordering on addiction with these baskets from Target. We use them for toys, books, blankets... and have them in pretty much every single room of the house. They make cleaning up with a toddler a breeze. 10. Hang clipboards for an interesting display. 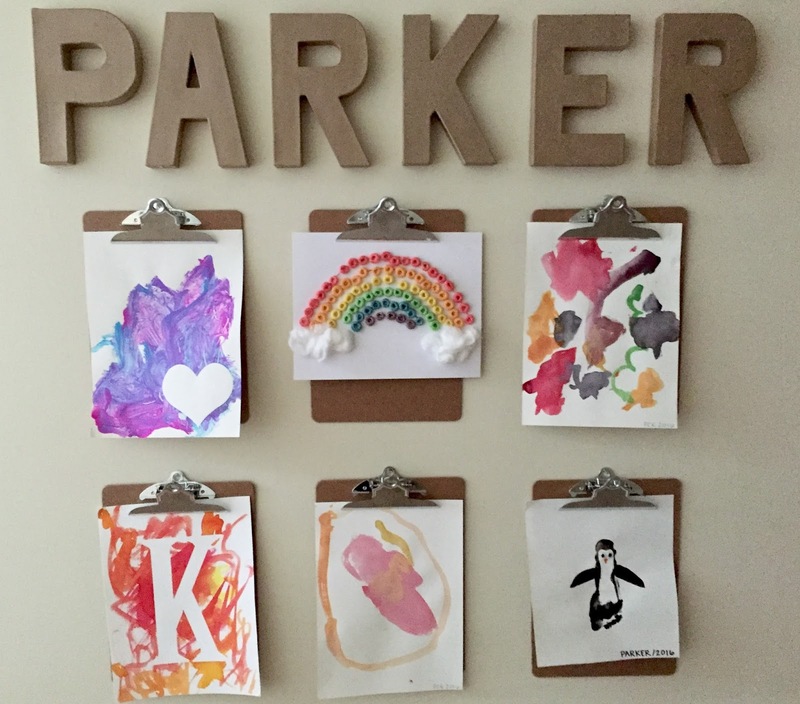 We use ours exclusively for Parker's artwork, but I think it would be handy for magazine pages you want to keep, forms that need to be completed or envelopes for the mailbox. So, do you already do any of these things? Are you going to try some out? 'Tis the season for Spring Cleaning! Must have tiered shelving for canned goods. Get in my pantry. Love these ideas...so with you on the matching hangars..life changing! I updated my pantry last year and added clear canisters with chalk labels and I love the way it turned out. I love all of this! I need to get some decorative hooks for my necklaces, asap! And the tiered shelving for cans is genius! Awesome ideas! 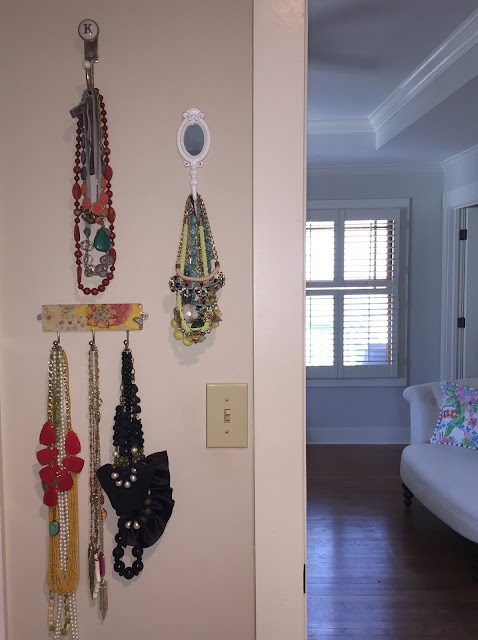 I did something similar with my necklaces - I bought a wall tie rack, hung it in my closet, and keep all of my necklaces on that. 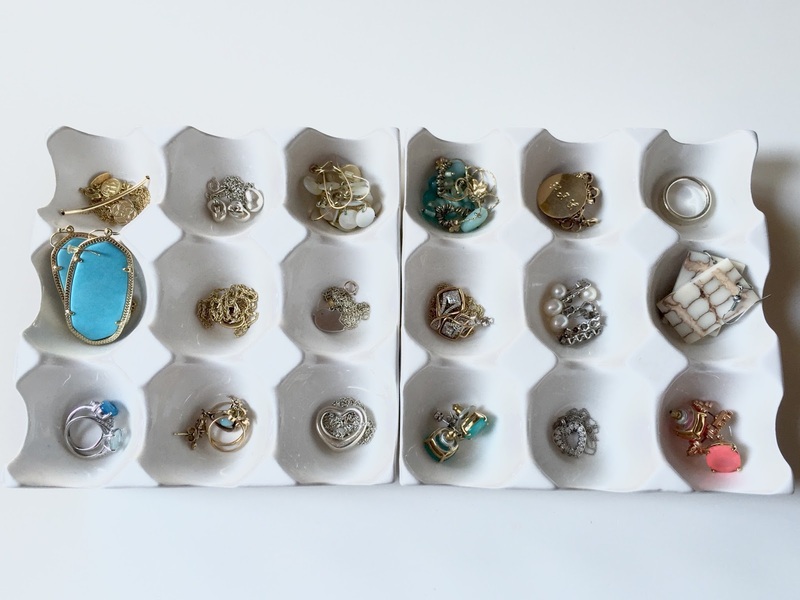 I also keep all of my earrings in ceramic egg crates - such perfect storage! I need those hangers and I need to follow the once and done rule - I'm so bad at that! I'm pinning every one of these ideas! Great post. Some terrific ideas here. I love the name above the artwork. So clever. Thanks for linking these great ideas on Tuesday Talk this week. Love! I find parting with clothes to be super hard... So for those who struggle to purge clothes: flip all your hangers around backwards on the rod and then as you wear something and put it away, flip them around the correct way. After a season, see what you never wore and donate it! These are all great tips...I have my necklaces on hooks, too! I love the idea of storing the pasta in containers and listing the cook time on the label!